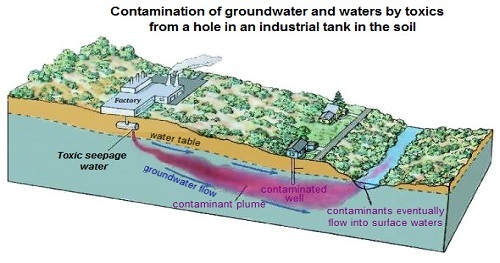 Ground Water Contamination: occurs when pollutants are released to the ground and make their way down into groundwater. It can also occur naturally due to the presence of a minor and unwanted constituent, contaminant or impurity in the groundwater, in which case it is more likely referred to as contamination rather than pollution. Materials from the land's surface can move through the soil and end up in the groundwater. For example, pesticides and fertilizers can find their way into groundwater supplies over time. Road salt, toxic substances from mining sites, and used motor oil also may seep into groundwater. In addition, it is possible for untreated waste from septic tanks and toxic chemicals from underground storage tanks and leaky landfills to contaminate groundwater. There are currently no items matching "Ground Water Contamination".